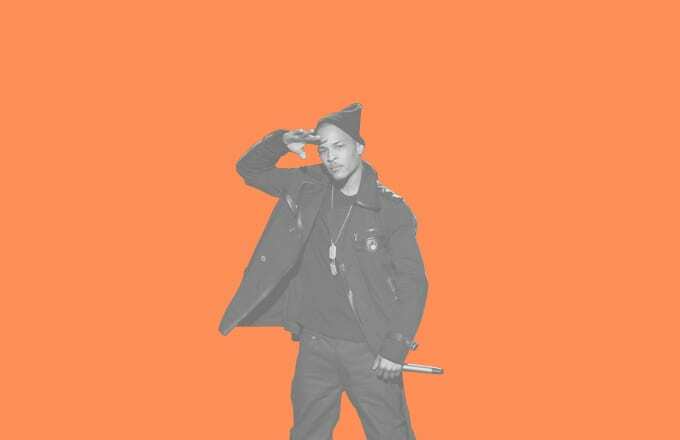 Ever since he released his debut album I'm Serious in 2001, Clifford Joseph Harris, Jr.—formerly T.I.P. before changing his rap name to T.I.—has transformed from decorated street soldier to fulfilling his self-proclaimed king of the South status. We won't deny his claim. In the last 14 years, T.I. has been a focal point for raw street lyricism that has cut through the mainstream and made the Atlanta native a star. His three album run of Trap Muzik, Urban Legend, and King capitalized on this authenticity, with T.I. providing hit singles that doubled as anthems in the streets and in the clubs. Only Ludacris, Jeezy, and Gucci Mane can possibly match what Tip has done as a solo act from Atlanta. Following his success in the studio, T.I. expanded into acting, starring in the 2006 film ATL and adding roles in Takers, American Gangster, and Identity Thief to his resume. He also stars alongside his family in the VH1 reality show T.I. & Tiny: The Family Hustle, and produces The Sisterhood of Hip-Hop. Still, this side hustle hasn't hindered his work as a rapper in the least. T.I. is entering a new phase of his career, as the longtime Atlantic Records signee parted ways with his home of 10 years, joining Columbia to release his ninth studio album, Paperwork. The project has already yielded "About the Money," T.I. 's white-hot collaboration with Young Thug. It easily sits as one of the best rap records in 2014. His other single—the Iggy Azalea-assisted "No Mediocre"—​may not be of the same caliber, but it's still doing numbers on the Billboard charts simply off the strength of T.I. 's stature. Like Rick Ross, he gets that work from his face. Today, T.I. turns 34 years young, which means it's the perfect time to celebrate his extensive catalog that includes three chart-topping albums, countless hit singles, and some of the most prolific trap tales ever told. Here are The 50 Best T.I. Songs​. Salute the king.